Some light reading. Timothée Chalamet was spotted flipping through the program at the 2019 SAG Awards on Sunday, January 27, and Twitter couldn’t get enough of the viral moment. 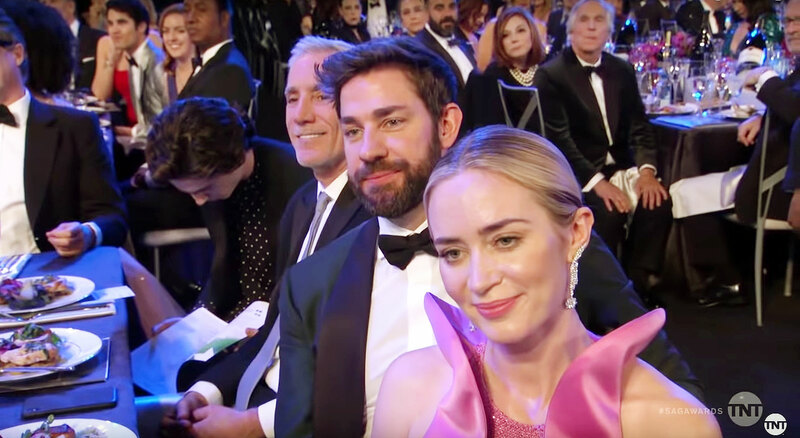 During host Megan Mullally’s opening monologue, the cameras panned through the star-studded audience and at one point stopped on Emily Blunt and John Krasinski. Right behind them sat the Beautiful Boy star, 23, who was caught staring down at the program on his lap. At first, Chalamet failed to notice that he was in the frame, but he closed the program after a few seconds and started laughing when Mullally joked that Blunt didn’t have to learn any lines for her role in A Quiet Place. The Lady Bird star was nominated for Outstanding Performance by a Male Actor in a Supporting Role for his part as real-life former drug addict Nic Sheff in Beautiful Boy, in which he starred opposite Steve Carell. However, the award ultimately went to Green Book star Mahershala Ali. Chalamet’s role also earned him nominations at the Golden Globe and Critics’ Choice Awards earlier this month, though he walked out empty-handed at those ceremonies as well.